Reports of acute nerve injury can be traced to 3500 years ago. In the well-known biblical story, Jacob suffered a sciatic nerve injury with a traumatic hip dislocation during his battle with the angel (Genesis 32:25-33). However, no specific technique to repair peripheral nerve damage was described until the 16th century. Technological advances in neurosurgical instrumentation and diagnostic imaging have led to great results in the repair of acute nerve injury. However, in recent years, reconstruction of nerve injuries has made little improvement in functional outcome after repair of peripheral nerves. [5, 6] See the images. Peripheral nerve, cross-section. Image courtesy of the Department of Histology, Jagiellonian University Medical College. The average incidence of radial nerve lesions is approximately 11%. Most reported series of radial nerve lesions are associated with fractures of the middle third of the humerus. A review of the literature demonstrated that 60% of radial nerve lesions were found in midshaft fractures and that 28% were found in fractures in the distal one third. However, Pollack et al and others reported that 63% of radial nerve lesions were found in fractures of the distal one third of the humerus. Dysfunction of peripheral nerves results from damage to the neuron, to the Schwann cells, or to the myelin sheath. Damaged nerves cannot transmit impulses in normal fashion. Many mechanisms of injury to peripheral nerves exist. Each mechanism of injury can cause specific nerve damage. The force and level of injury to the shoulder plays an important role in the type of nerve injury sustained. Different mechanisms of injury and other contributing factors are discussed in this section. The second mechanism of injury is crush and percussion injury. This injury can be described through an animal model. With this model, the usual method is squeezing the nerve with smooth-tipped forceps, which induces focal compression injury. In humans, compression injuries can be induced by fractures, hematomas, and compartment syndrome. Proximal venous ligation, direct trauma to muscle, infection, burns, and localized pressure by casts or by circular dressings also are causes of compartment syndrome. Other contributing factors explain the statistical probability in the distribution of acute nerve injury. The anatomical relationship between the peripheral nerves and surrounding tissues causes certain nerves to be vulnerable to injury. The peroneal division of the sciatic nerve is affected more commonly in traumatic hip dislocations because the peroneal division is tethered at the fibular neck and at the sciatic notch and the tibial division is tethered only at the sciatic notch. This difference allows the tibial division a greater length over which to dissipate stresses. The funiculi of the peroneal division are fewer, larger, and protected by less connective tissue than those in the tibial division. Therefore, at the time of injury, a dislocated femoral head or displaced acetabular fragments can directly injure the sciatic nerve. In some cases, the injury does not match the clinical presentation. Operative findings of nerve injury may or may not match clinical findings. Data exist of gross operative evidence of nerve injury without clinical evidence of neurological dysfunction, such as with sheath hematoma and compression by fracture fragments. Conversely, data exist of intraoperative grossly normal-appearing nerves with clinical paresis. These deficits may develop after initially appearing with a normal neurological examination. Surgical intervention for acute nerve injury is based on the extent of damage to the nerve and the nerve's functional viability. Consider each patient on an individual basis. When evaluating patients for surgery, surgeons should consider the location, the extent of the injury, the patient's age, and the patient's medical condition. Two important questions to consider before surgery are whether function can be obtained from the repaired nerve and whether the potential benefit to the patient outweighs the surgical risks, costs, and loss of productivity. For example, adults older than 40 years rarely achieve a functional result from ulnar nerve repairs proximal to the elbow. Consequently, these patients may not be candidates for surgery. Peripheral nerves are comprised of axons and associated Schwann cells enclosed in a basement membrane. Schwann cells ensheathe individual axons in myelinated fibers and groups of axons in unmyelinated fibers. The basement membrane is surrounded by thin collagen fibers called the endoneurium. The axon and Schwann cell composite are termed the endoneurial  or Schwann  tube. Endoneurial tubes are grouped together, forming a variable number of fascicles. Perineurium surrounds each fascicle. 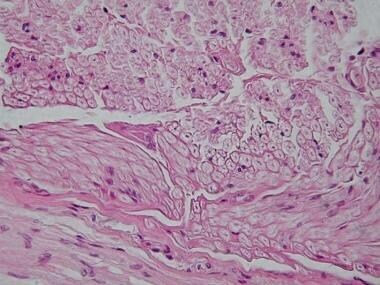 Perineurium is composed of collagen fibers and concentric layers of closely packed flattened cells, united by tight junctions. The perineurium creates a diffusion barrier against the surrounding environment, similar to the blood-brain barrier. The perineurium maintains a positive intrafascicular pressure and protects against infection. Cornwall R, Radomisli TE. Nerve injury in traumatic dislocation of the hip. Clin Orthop. 2000 Aug. (377):84-91. [Medline]. Artico M, Cervoni L, Nucci F, Giuffré R. Birthday of peripheral nervous system surgery: the contribution of Gabriele Ferrara (1543-1627). Neurosurgery. 1996 Aug. 39(2):380-2; discussion 382-3. [Medline]. Colohan AR, Pitts LH, Rosegay H. Injury to the peripheral nerves. Feliciano DV, Moore EE, Mattox KL. Trauma. 3rd ed. Stamford, Conn: Appleton & Lange; 1996. 853-62. Grant GA, Goodkin R, Kliot M. Evaluation and surgical management of peripheral nerve problems. Neurosurgery. 1999 Apr. 44(4):825-39; discussion 839-40. [Medline]. Trumble TE. Peripheral nerve injury: pathophysiology and repair. In: Feliciano DV, Moore EE, Mattox KL, eds. Trauma. 4th ed. New York, NY: McGraw-Hill; 2000:. 1047-55. An S, Zhang P, Peng J, Deng L, Wang Z, Wang Z, et al. Motor function recovery during peripheral nerve multiple regeneration. J Tissue Eng Regen Med. 2013 Dec 10. [Medline]. Greenfield LJ. Surgery: Scientific Principles and Practice. 2nd ed. Philadelphia, Pa: Lippincott-Raven; 1997:. 2172-3. Ristic S, Strauch RJ, Rosenwasser MP. The assessment and treatment of nerve dysfunction after trauma around the elbow. Clin Orthop Relat Res. 2000 Jan. (370):138-53. [Medline]. Zhang HM, Zhou LJ, Hu XD, Hu NW, Zhang T, Liu XG. Acute nerve injury induces long-term potentiation of C-fiber evoked field potentials in spinal dorsal horn of intact rat. Sheng Li Xue Bao. 2004 Oct 25. 56(5):591-6. [Medline]. Barbour JR, Iorio ML, Halpern DE. Surgical decompression of the great auricular nerve: a therapeutic option for neurapraxia following rhytidectomy. Plast Reconstr Surg. 2014 Feb. 133 (2):255-60. [Medline]. Clark AJ, Auguste KI, Sun PP. Cervical spinal stenosis and sports-related cervical cord neurapraxia. Neurosurg Focus. 2011 Nov. 31 (5):E7. [Medline]. Schwartz SI. Principles of Surgery. 7th ed. New York, NY: McGraw-Hill; 1999:. 2048-53. Malessy MJ, Pondaag W. Neonatal brachial plexus palsy with neurotmesis of C5 and avulsion of C6: supraclavicular reconstruction strategies and outcome. J Bone Joint Surg Am. 2014 Oct 15. 96 (20):e174. [Medline]. Visser CP, Coene LN, Brand R, Tavy DL. The incidence of nerve injury in anterior dislocation of the shoulder and its influence on functional recovery. A prospective clinical and EMG study. J Bone Joint Surg Br. 1999 Jul. 81(4):679-85. [Medline]. Garg A, McQueen MM, Court-Brown CM. Nerve injury after greater tuberosity fracture dislocation. J Orthop Trauma. 2000. 14(2):117-8. Geoffrey Kuhlman, MD, CAQSM. Burners (Stingers): Acute Peripheral Nerve Injury in the Athlete. [Full Text]. Perlmutter GS. Axillary nerve injury. Clin Orthop. 1999 Nov. (368):28-36. [Medline]. Berkow R, ed. The Merck Manual of Medical Information. Whitehouse Station, NJ: Merck & Co; 1997:. 330. Bonnard C, Anastakis DJ, van Melle G, Narakas AO. Isolated and combined lesions of the axillary nerve. A review of 146 cases. J Bone Joint Surg Br. 1999 Mar. 81(2):212-7. [Medline]. Adams JH, Duchen LW, eds. Greenfield's Neuropathology. 5th ed. New York, NY: Oxford University Press; 1992:. 1160-6.
van Neerven SG, Bozkurt A, O'Dey DM, Scheffel J, Boecker AH, Stromps JP, et al. Retrograde tracing and toe spreading after experimental autologous nerve transplantation and crush injury of the sciatic nerve: a descriptive methodological study. J Brachial Plex Peripher Nerve Inj. 2012 Apr 30. 7(1):5. [Medline]. [Full Text]. Isaacs J. Major peripheral nerve injuries. Hand Clin. 2013 Aug. 29 (3):371-82. [Medline]. Santos PM. A functional model system of an hypoxic nerve injury and its evaluation. Laryngoscope. 2000 May. 110(5 Pt 1):845-53. [Medline]. Kim DH, Kline DG. Management and results of peroneal nerve lesions. Neurosurgery. 1996 Aug. 39(2):312-9; discussion 319-20. [Medline]. Townsend PL. Microsurgical techniques in reconstructive surgery. In: Keen G, Farndon JR, eds. Operative Surgery and Management. 3rd ed. Oxford, UK: Butterworth-Heinemann; 1994:. 434-5. O'Malley MP, Pareek A, Reardon P, Krych A, Stuart MJ, Levy BA. Treatment of Peroneal Nerve Injuries in the Multiligament Injured/Dislocated Knee. J Knee Surg. 2015 Dec 18. [Medline]. Simon A. Cudlip, BSc FRCSFranklyn A. Howe, DPhil, John R Griffiths BAnthony Beli, FRCS. Magnetic Resonance Neuropathy of Sciatic Nerve Following Crush Injury, and Correlation with Functional Deficit. spineuniverse.com. 02/20/2007. [Full Text]. Mitchell CH, Brushart TM, Ahlawat S, Belzberg AJ, Carrino JA, Fayad LM. MRI of sports-related peripheral nerve injuries. AJR Am J Roentgenol. 2014 Nov. 203 (5):1075-84. [Medline]. Britz GW, Haynor DR, Kuntz C, Goodkin R, Gitter A, Maravilla K. Ulnar nerve entrapment at the elbow: correlation of magnetic resonance imaging, clinical, electrodiagnostic, and intraoperative findings. Neurosurgery. 1996 Mar. 38(3):458-65; discussion 465. [Medline]. Kuntz C 4th, Blake L, Britz G, Filler A, Hayes CE, Goodkin R. Magnetic resonance neurography of peripheral nerve lesions in the lower extremity. Neurosurgery. 1996 Oct. 39(4):750-6; discussion 756-7. [Medline]. West GA, Haynor DR, Goodkin R, Tsuruda JS, Bronstein AD, Kraft G. Magnetic resonance imaging signal changes in denervated muscles after peripheral nerve injury. Neurosurgery. 1994 Dec. 35(6):1077-85; discussion 1085-6. [Medline]. Elias I, Pahl MA, Zoga AC, Goins ML, Vaccaro AR. Recurrent burner syndrome due to presumed cervical spine osteoblastoma in a collision sport athlete - a case report. J Brachial Plex Peripher Nerve Inj. 2007. 2:13. [Medline]. Newman JP, Verity AN, Hawatmeh S, Fee WE Jr, Terris DJ. Ciliary neurotrophic factors enhances peripheral nerve regeneration. Arch Otolaryngol Head Neck Surg. 1996 Apr. 122(4):399-403. [Medline]. Bertelli JA, Taleb M, Mira JC, dos Santos AR, Calixto JB, Kassar L. Selective restoration of sensation by peripheral nerve grafts directly implanted into the contralateral C7 dorsal root ganglion: an experimental study in rat brachial plexus. Neurosurgery. 1998 Jan. 42(1):125-9. [Medline]. Utley DS, Lewin SL, Cheng ET, Verity AN, Sierra D, Terris DJ. Brain-derived neurotrophic factor and collagen tubulization enhance functional recovery after peripheral nerve transection and repair. Arch Otolaryngol Head Neck Surg. 1996 Apr. 122(4):407-13. [Medline]. Taras JS, Jacoby SM, Lincoski CJ. Reconstruction of digital nerves with collagen conduits. J Hand Surg Am. 2011 Sep. 36(9):1441-6. [Medline]. Samardzic M, Rasulic L, Grujicic D, et al. Results of nerve transfers to the musculocutaneous and axillary nerves. Neurosurgery. 2000 Jan. 46(1):93-101; discussion 101-3. [Medline]. Asensio-Pinilla E, Udina E, Jaramillo J, Navarro X. Electrical stimulation combined with exercise increase axonal regeneration after peripheral nerve injury. Exp Neurol. 2009 Jun 3. [Medline]. Fernandez E, Pallini R, Marchese E, Lauretti L, Bozzini V, Sbriccoli A. Reconstruction of peripheral nerves: the phenomenon of bilateral reinnervation of muscles originally innervated by unilateral motoneurons. Neurosurgery. 1992 Mar. 30(3):364-8; discussion 368-9. [Medline]. Horowitz Stephen H. Venipuncture-Induced Nerve Injury,A Review. Journal of Neuropathic Pain & Symptom Palliation. 2005. 1 issue 1:109-114. Huang JH, Cullen DK, Browne KD, Groff R, Zhang J, Pfister BJ. Long-term survival and integration of transplanted engineered nervous tissue constructs promotes peripheral nerve regeneration. Tissue Eng Part A. 2009 Jul. 15(7):1677-85. [Medline]. [Full Text]. Intiso D, Grimaldi G, Russo M, Maruzzi G, Basciani M, Fiore P. Functional outcome and health status of injured patients with peripheral nerve lesions. Injury. 2009 Jun 12. [Medline]. Jin L, Jianghai C, Juan L, Hao K. Pleiotrophin and peripheral nerve injury. Neurosurg Rev. 2009 May 8. [Medline]. Lewin SL, Utley DS, Cheng ET, Verity AN, Terris DJ. Simultaneous treatment with BDNF and CNTF after peripheral nerve transection and repair enhances rate of functional recovery compared with BDNF treatment alone. Laryngoscope. 1997 Jul. 107(7):992-9. [Medline]. McGillicuddy John E. Neve Injuries:Operative Results for Major Injuries, Entrapments, and Tumors. Neurosurgery. 1997. 40 (5):1099-1100. Muir D. The potentiation of peripheral nerve sheaths in regeneration and repair. Exp Neurol. 2009 Jun 6. [Medline]. Quan, Dianna, Bird Shawn J. Nerve Conduction Studies and Electromyography in the Evaluation of Peripheral Nerve Injuries. Unniversity of Pennnsylvania Orthopaedic Journal. 1999. 12:45-51. Senes FM, Campus R, Becchetti F, Catena N. Upper limb nerve injuries in developmental age. Microsurgery. 2009 May 1. [Medline]. Alaqeel A, Alshomer F. High resolution ultrasound in the evaluation and management of traumatic peripheral nerve injuries: review of the literature. Oman Med J. 2014 Sep. 29 (5):314-9. [Medline]. The authors and editors of Medscape Reference gratefully acknowledge the contributions of previous author Caitlin Gonzalo, TO, to the development and writing of this article.